One of the questions that we'll have to ask ourselves throughout our lives is: "What am I willing to pay for this?" On a literal level, we have to ask this question when we contemplate buying cars or purchasing homes. Is the debt that we'll be paying for the next few years worth the thing we're paying for? On a metaphorical level, we also have to answer this question — is the inevitable pain worth entering the relationship? Is speaking our mind at work worth the risk? "Character and Fitness" was a pretty solid finale for Suits, and it found our characters asking this question of themselves. Is it worth the risk for Mike to try and get into the Bar? Is the buyout worth Donna sacrificing her dream? Is Harvey willing to sacrifice his career for Mike's? Was Louis' honesty worth potentially costing him his relationship with Tara? How far are these characters willing to go in order to achieve their dreams? Let's talk about this episode's plot from a practical level first: Mike Ross is now officially on his way to becoming an official lawyer! Though the episode ends happily for him — with the promise of a career in being able to help people from the courtroom again — it doesn't begin that way. Mike and Harvey's biggest hurdle in the episode comes in the form of Anita Gibbs, whose presence on the character and fitness panel pretty much ensures the fact that Mike Ross will not be getting into the Bar. So Harvey and Mike divide and conquer in the episode: Harvey goes out in search of dirt on Walter Sampson (the guy who Anita replaced on the panel), while Mike decides to put that photographic memory to good use by studying every unique case of a former felon getting into the Bar. But even though Mike hits the books to some good results (with back-up from Rachel, who also studied up on the Bar and knows that Mike is allowed a character witness — more on this later) and is able to hold onto his defense long enough in the first character and fitness hearing to ward off Anita Gibbs' bloodhound-like desire for justice, Harvey isn't having the same kind of luck. He keeps striking out when it comes to Sampson. Even the shady guy that Harvey and Louis approached for blackmail last week can't find anything on him. Harvey begins to genuinely panic, which is unnerving because we never see him shaken. This hearing is far too important for Harvey to bluff Sampson and have it backfire. I actually really loved the fact that we see Harvey a bit unnerved in this episode. It reminds us that even though he's a superhero to pretty much everyone around him, even Harvey doesn't always have all the answers. Even he doubts himself sometimes. The important thing is that Harvey surrounds himself with people who remind him of his capabilities. In this case, that person is Donna (and let's be honest, it's usually ALWAYS Donna). She tells him that he is capable of getting dirt on anyone. In fact, she motivates him with these words: "Enough is enough. Go do what you do." This seems to stir something within Harvey, who goes to Sampson and threatens him. Harvey wants information, but the problem is that he's going about it the way he always does. There is one person in this episode who understands the value of playing the long game, which we will discuss momentarily. The most important part of this episode though is when Harvey realizes he has nothing left to take Anita Gibbs down with. He's been rendered useless and yet he still has one more trick up his sleeve -- he hands over Liberty Rail intel to Anita Gibbs. There are no strings attached to the information, and Harvey does this to prove to Anita that if HE can change his ways, then so can Mike. She should believe him. Anita Gibbs is ruthless though. I think she's one of the most interesting antagonists on Suits because for all intents and purposes, Anita represents the law. She represents doing things by the book — orderly, structured, and fairly. But there is a darkness to Anita too. She's blinded by her pursuit for justice that she is willing to turn well-meaning people into long-suffering martyrs to make herself feel like the better person. Anita's biggest issue is that she's self-righteous. She's desperate to make someone pay for their crimes, and is insistent that people are black and white. But if anything, Suits proves that good people can do bad things and still remain essentially good. Villains aren't always totally evil, and the good guys don't always make the right choices. So when Anita proposes a trade: she'll vote on admitting Mike into the Bar only if Harvey admits that he knew about Mike's fraud the whole time, which would strip him of his license. And... I'm not entirely surprised. And I'm also not surprised that Harvey seriously considers taking it. Rachel did say that if anything went wrong this time around, Harvey would have to be the one to take the fall for Mike. She would make sure of it. Harvey sacrificing something for Mike proves how much he cares about him. But falling on his sword now isn't heroic — it's stupid. Louis and Mike tell Harvey as much. For one thing, Louis now relies on Harvey as a partner. That means that Harvey can't make decisions and then tell Louis about them; they make decisions as a team. And Mike would rather go back to jail than let Harvey take the fall for him. It's not worth it if it means losing his best friend. The scene between Harvey, Louis, and Mike is one of the best of the episode because it reminds us how far these men have come. They all have each others' backs now (even Harvey and Louis, shocker! ), and have grown to realize that there are important things in their lives that they're unwilling to sacrifice. And that includes one another. Usually, I'll get press screeners for Suits. But the finale wasn't up by the time this episode aired live. And boy, I'm glad I got the chance to witness "Character and Fitness" live. Because Jessica Pearson returned to her kingdom. Rachel, as I mentioned above, figures out a loophole for Mike in his hearing: he's allowed to have a character witness testify on his behalf. Mike seems to know exactly who he can ask to be his representative, and approaches Julius (welcome back, Malcolm-Jamal Warner!). Initially, Mike encounters an issue: Julius doesn't believe that Mike has changed. After all, the truth of the matter is that Harvey and Mike pulled some shady crap in order to get Mike into the Bar. How is doing this proving that Mike learned anything during his prison stint? Julius essentially says what we've all been thinking: Mike hasn't done a whole lot post-prison to prove that he's a changed man. He might want to believe he's different and better now — that he's doing all of this to help people — but is that really true? Honestly, I'm not always Mike Ross' biggest fan. Though I'm proud of the fact that he's sticking to his whole "I want to be better so I can do better for others" moral code, he didn't seem to learn anything from prison. He came out of it still pretty self-involved, which is definitely problematic. As he is wont to do, Mike gives an impassioned plea to Julius, saying that his honesty is a step in the right direction: the old Mike Ross wouldn't have told Julius the truth about his less-than-ethical methods of trying to get back into the Bar. Because of this, Julius decides to testify at Mike's hearing. Even though I always seem to be on the fence about Mike as a character — I really don't think most of the life lessons he's supposed to have learned have actually stuck — I really enjoyed watching Julius shut Anita Gibbs up. He essentially tells her that if she's already made her mind up about Mike, she doesn't deserve to be on the character and fitness panel. DANG. In spite of this, Anita isn't backing off easily. She'll do everything in her power to keep Mike from becoming a real lawyer. But then, the game changes. Jessica Pearson enters the room, with the flair and grace and poise that is reserved only for this woman. She defends Mike by reminding Anita of a time she once showed compassion to someone. And the person she showed compassion to is now a doctor, saving lives. If Anita hadn't done that, people wouldn't be alive today. This seems to change Anita's tune, and she votes to let Mike into the Bar. It's unanimous: Mike is going to be a lawyer! Fun fact though: Jessica told the story about Anita displaying compassion for a reason. Jessica knows how Anita got onto that panel — and what she must have against Sampson — and subtly let Anita know in the hearing through the story. When Harvey asks for the information so they can take Anita down once and for all, Jessica refuses. The point she makes is a really valid one: sometimes the best way to someone is through compassion and grace, not force. It's a lesson I hope that Harvey and Louis will learn as they continue being partners at the firm. Sometimes a show of strength is a show of subtly trusting another person to do the right thing without forcing their hand. I miss Jessica Pearson. I love Donna Paulsen. But this episode broke my heart in regards to her story. Louis meets with patent owners on Donna's behalf. As it turns out, she and Benjamin are having a difficult time securing the patent for The Donna because it's too similar to another patent. When Louis meets with them, Donna only has one word of warning: don't lose his temper and blow any kind of chance for a deal. To Louis' credit, he does not. But he's ambushed by the patent owners, who really just want to threaten him in person. They tell him that they'll sue Donna for $90 million if she chooses to try and pursue the patent. Again, to Louis' credit, he still doesn't blow up at the men and decides to calmly (and privately) draft up some sort of buyout deal without telling Donna. How does she find out, you ask? When she is called into a meeting with Louis, Stu, and Benjamin. At first, when Donna hears that the meeting went awry, she blames Louis. It must have been something he said or did. But then Louis calmly presents the evidence and the buyout offer. Benjamin and Stu back him up (the latter saying that he took the offer to his own lawyers and they were shocked Louis could pull off what he did), and then the group presents the final decision to Donna: take the buyout, or don't. Either way, it seems like The Donna has reached the end of its run for use outside of the offices of Pearson Specter Litt. Donna is crushed. It's one thing to dream, but it's another to have those dreams within your grasp and then watch as they're dissolved. Seeming to think he'll side differently, Donna presents the offer to Harvey — and he tells her to take the buyout. Honestly, I think the reality of knowing this is the right decision is heartbreaking for Donna. She really wanted to believe she could succeed outside of Harvey and the firm's shadows. She thought she was more than just a legal secretary. But the harsh words from the investors and the inevitability of a buyout weakened Donna's resolve. Kudos to Sarah Rafferty for such a sad scene. Seemingly discussing the whole of her life (and perhaps relationship with Harvey), Donna tearfully says: "I don’t want the money. I want something more, and I’ve never said that out loud, but I can’t pretend that I don’t anymore," What does Donna want, exactly? I think she wants the chance to chase and catch a dream that isn't tied to the firm. She wants to be seen as more than just Harvey's secretary. And it hurts so much to know that even though she tries to see herself that way, other people don't. Maybe there's even some subtext here in terms of what Donna wants from her relationship with Harvey. Either way, Donna is not satisfied and she breaks down because of it. Honestly, it was such a sad scene because I'm not used to seeing Donna doubt herself or her abilities. I sincerely hope that when this show returns next season, we'll get the chance to see Donna find the confidence to keep pursuing the things that she wants in life and the things that make her happy — even if it means she has to fail a few times to do so. Suits' season has been interesting, and I'm thankful that "Character and Fitness" was a solid end to it. With Mike now a lawyer who's still working for the clinic (but doing so out of the Pearson Specter Litt offices), it'll be nice to see the relationship dynamics restored between our show's core characters. While not everyone got their happy ending in this finale, everyone learned something a bit more about themselves in the process. And for that, I'm grateful. In more sad news, Tara decided to break up with Louis via voicemail. This isn't sad for me, because I couldn't stand Tara. But it is extremely devastating to Louis, who just can't seem to find a love that lasts. What was most heartbreaking of all, however, was the fact that Rachel was right there beside him to hug and comfort him as he wept. I absolutely love little glimpses into the Louis/Rachel friendship because they've been through so much together. Seeing her embrace him as he mourned the loss of a relationship was bittersweet, but perfect for their final scene in the finale. "Shouldn't you be at the clinic saving whales?" Have you ever noticed that characters in Suits spend a lot of time staring dramatically out of their window-lined offices? JESSICA AND HARVEY HUGGED AND IT WAS ADORABLE. The fact that Mike is taking Harvey's office next season and Harvey is moving into Jessica's somehow just feels wrong. 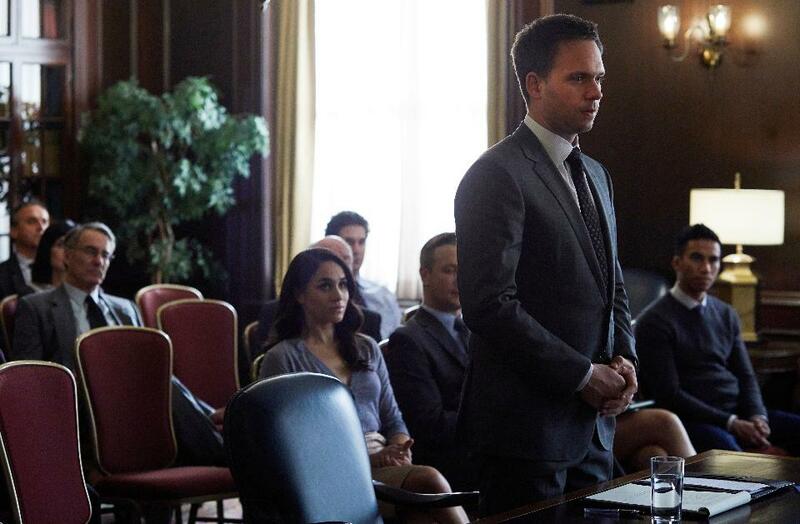 What did you all think of the Suits finale and season overall? Sound off in the comments below. See you around for season seven this summer!